a long work week behind me again! i hope you´re enjoying your weekend as much as i do! deeply in love with pastels for spring. and i finally decided to buy another Su- Shi satchel to go with my pastel outfits that i will be wearing to death come summer! Your bag is perfect! Love it. This outfit is so cute! The colors match perfectly! I especially like the combinationof the 3D sweater with the pants (from H&M ?!?!). I'm not a fan of the shoes, though. Perfect spring look with all the pastel colours! gorgeous floral top! i love those mint green trousers! I really love your sunglasses! pastel colour, i'm in love! you suit everything. you're amazing! i love everything of your outfit! so pretty! WOOW lady you look gorgeous! and I love that bag! I'm going to check it out know! You look smashing in pastels, girl! 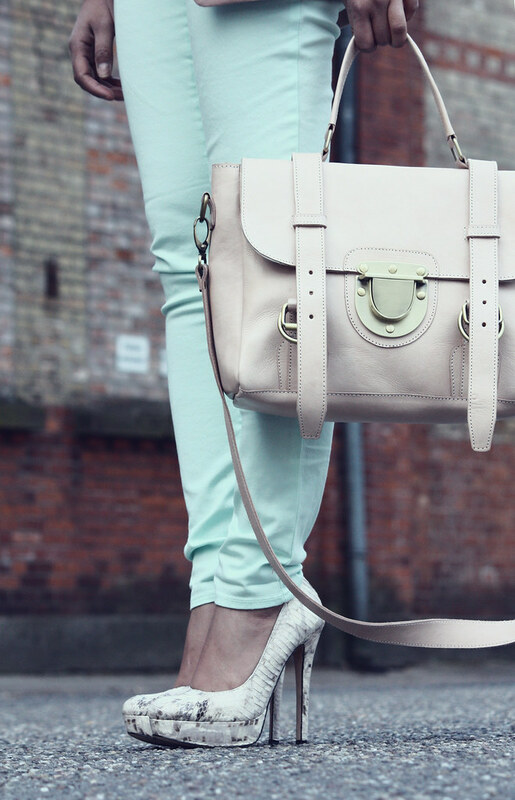 And the satchel is super pretty. Love that refreshing minty shade! Oh cutie, your outfit is absolutely gorgeous, stunning... just perfect! Hey, first time I see you in such paster colors :) You look very fresh and bright! I adore the whole outfit, you look amazing! I love those colors. You look fabulous. I adore every single pieces on you! awesome! Thanks for stopping by our blog the other day! I am seriously loving those pumps!